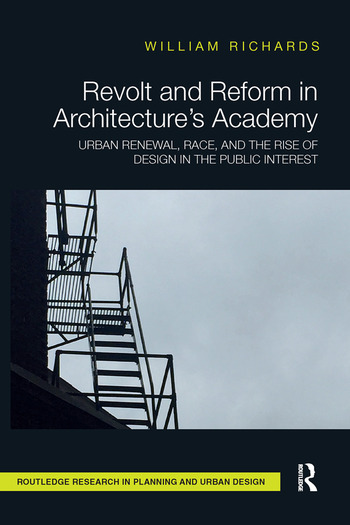 Revolt and Reform in Architecture’s Academy uniquely addresses the complicated relationship between architectural education and urban renewal in the 1960s, which paved the way for what is today known as public interest design. Through an examination of curricular reforms at Columbia University’s and Yale University’s schools of architecture in the 1960s, this book translates the "urban crisis" through the experiences of two influential groups of architecture students, as well as their contributions to design’s lexicon. The book argues that urban renewal and campus expansion half a century ago recast architectural education at two schools whose host cities, New York and New Haven, were critical sites for political, social, and urban upheaval in America. The urban challenges of that time are the same challenges rapidly growing cities face today—access, equity, housing, and services. As architects, architects in training, and architecture students continue to wrestle with questions surrounding how design may serve a broadly defined public interest, this book is a timely assessment of the forces that have shaped the debate. Introduction 1. Architecture’s Academy 2. Gym Crow Must Go 3. Renewing New Haven 4. What Is the Public Interest? William Richards is a writer who has covered architecture, cities, and design culture for Architect Magazine, Architectural Record, Future Anterior, Landscape Architecture, and other magazines and journals. He holds a doctorate in the history of art and architecture from the University of Virginia and lives in Washington, D.C.